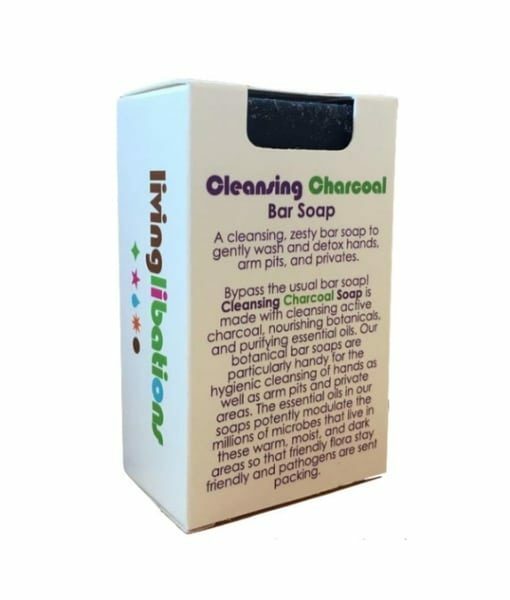 Cleansing Charcoal Soap is a botanical bar soap crafted with purifying activated charcoal, which acts like a magnet to remove toxins from the skin. The beneficial binding action makes it a formidable cosmoetic cleanser as it binds to toxins to purify pores. Please note – Nailbrush in picture is sold separately. Saponified Olive Oil (Olea europaea) – Saponified olive oil captures all of the nourishing, moisturizing properties of olive oil while enhancing the oil’s ability to clean the skin, hair, and scalp. Saponification is a chemical reaction that occurs when the oil is treated with a highly alkaline solution. Fats are hydrolyzed before combining with alkali to form natural glycerin, a softening agent. This creates soap with a very low pH. Saponified olive oil is said to increase skin’s porousness to help the skin to release toxins and absorb moisture. Lemongrass (Cymbopogon citratus) Essential Oil -Enliven your life with Lemongrass essential oil. This lively essence distilled from tropical-grass goodness is effervescent in its ability to animate mind, emotions and spirit. If one is feeling fatigue or foggy in the morning, this physically and psychologically invigorating essence is the perfect way to start the day by inhaling, showering, or bathing. Brimming with monoterpenoid aldehydes, it also adored for its opulent amounts of jovial citral, gentle geraniol and body-loving d-limonene. It is a terrific toning oil for caring of the skin’s connective tissue, muscle-melting massages, aiding athlete’s feet, and stimulating sluggish skin areas.